A game day is a wondrous thing. Just this last weekend one of our local distributors opened their warehouse, complete with demo shelves opulent with fresh titles from the shipping containers and ample table space for gamers to plant themselves at and enjoy a day of gaming. Paul and I crawled from our hovels to get there bright and early and returned before dusk with the spoils of our adventures. Interesting games were played, both old and new, and we’d far rather entice you with a breakdown – you don’t care to know what our debilitating board game purchase disorder ended filling our boot with! Some induced relaxation while others caused visible nervous twitching, but all made memorable impressions, either positive or negative on my shopping list. All this dexterity goodness, only without the giant pretzels. 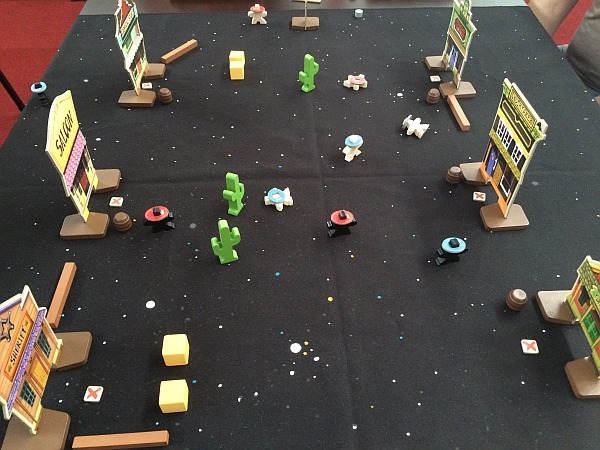 We started the morning with Flick ’em Up which made me nostalgic for cowboy movies and at the same time highlighted a weak-spot in my genre experience – dexterity games. 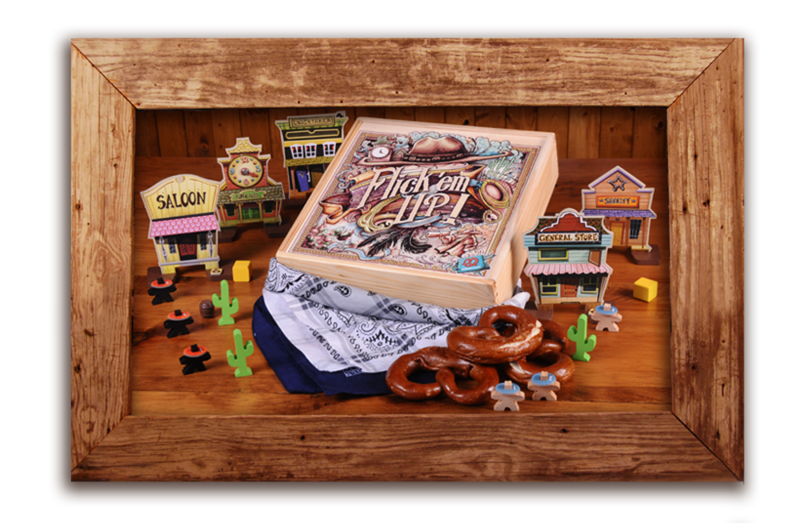 For those of you who’ve had your head down in a shot of whiskey at the local saloon these past few months, Flick ’em Up is from Pretzel Games and allows you to recreate the battles between law men and scoundrels in the old west in 3-D glory! Our opening scenario had a showdown in the high street, Cooper Clan versus the Law, and had us flicking movement tokens to seek cover from the hail of bullets while at the same time firing from the hip to wound the opposing team. Having never played a dexterity game before, the new skill had me baffled and led to some ridiculous misses from around 10cm with my shots and admittedly once flicking my sheriff into a cactus! As the games progressed I enjoyed the subtleties of flanking, pinpoint movement and the satisfaction of blasting a meeple at point blank range with a flick. I even won the second game with a duel between my Papa Luke of Cooper Clan fame and Sheriff Pete. Definitely something different that everyone should try. In tribute to FireFly, we had our showdown on a space felt map. 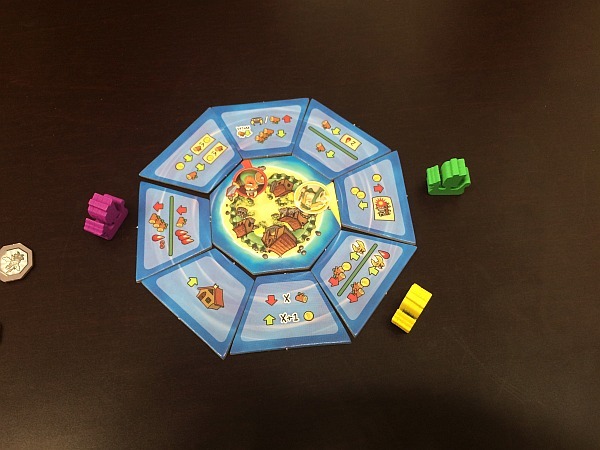 We then dusted off our boots and donned our helmet to pillage and plunder in the small box game of Bottlecap Vikings from Tasty Minstrel Games. TMG have been on an impressive run of late with getting a lot of game into smaller packages, and this Rondel based worker placement game was no different. We all sailed our Galleys around the Isle (bottlecap shaped) trying to either earn 10 Glory or to progress to construct the largest Village, all whilst earning gold, wood and damaging each other in combat. To Battle, To Glory! Avoiding Valkyries and grabbing timber and coin! In the early moments with an unclear rule set on first read, we struggled to get going, dipping oars awkwardly as we set out to find development and movement benefits. But after the wind caught our sails the game offered interesting choices and subtle nuances. Despite the shallow theme, I enjoyed this little title with its multiple possible setups providing decent variation – all in a compact box for lunch time gaming. Worth a look, but not a must buy from me. Bomb Squad tested team work in a way that I hadnt seen before in a game, and I enjoyed each tick of the timer. Bomb Squad, keeping with Tasty Minstrel Games, was the surprise of the day for me after an initial glance of the cover did little to indicate what was ticking beneath. Combining the co-operative card identification and playing system of Hanabi with the programming of Robo-Rally and the urgency and countdown elements of Escape! : Curse of the Hidden Temple, Bomb Squad keeps players constantly involved and improves on many of the aspects of all the games it emulates. 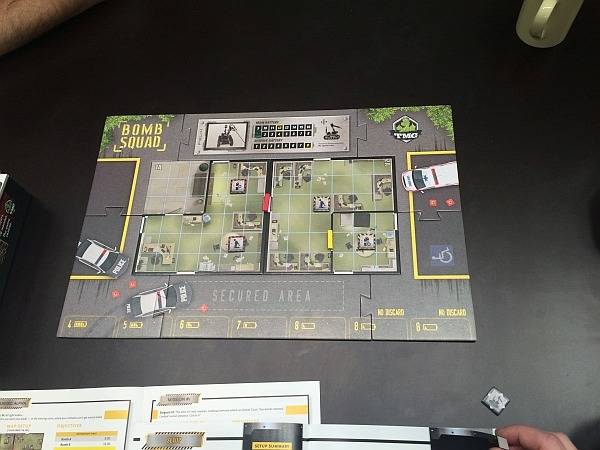 Players need to have their cards identified (movement, open door, diffuse bomb, and rescue hostage cards in various colours) and program a bomb disposal robot to move through buildings. In our training mission, in 8 minutes we needed to rescue a red hostage, diffuse a red bomb (then to be granted an additional 7 minutes) and then move through a red door to repeat this all with now yellow objectives to finish the scenario. Where Hanabi allows you to contemplate the beauty of fireworks, Bomb Squad is all about planning ahead, snap calls of information and remembering what’s in your hand, as well as what’s programmed into the robot already! Tensions ramps up with the ticking downloaded app, as players try to get everyone out alive. While not a casual game and not for those who dislike pressure, I loved Bomb Squad and could imagine playing this game multiple times over a single game night with the same people as you start creating your own “language” commands to speed up the process. Our group spoke with high energy in between the 3 attempts and made progress each time we played. Definitely a game on my radar that wasn’t before! That’s a wrap for the first issue of Play What? Let us know what you think of the segment, what games you’d like us to play and what you’ve jammed recently that caught your eye!